Categoria de Produto do Wear Resistant Pipe, somos fabricantes especializados da China, Thick Steel Pipe , Customized Resistant Pipe fornecedores / fábrica, atacado alta qualidade produtos de Resistant Steel Pipe R & D e fabricação, temos a perfeita serviço e suporte técnico pós-venda. Aguardamos a sua colaboração! Wear resistant pipeline transportation has been in power, metallurgy, coal, petroleum, chemical, building materials, machinery and other industries, and the rapid development of the. 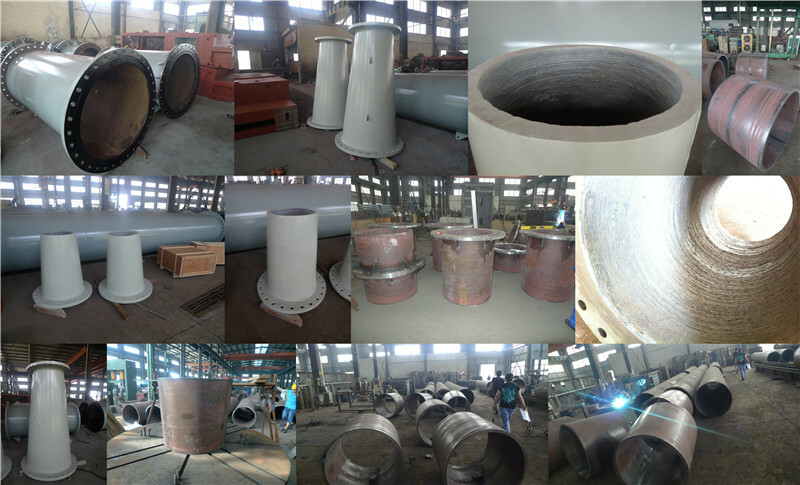 When the wear resistant pipe is transported in the grinding of material (such as ash, coal, mineral powder), there are a wear-resisting pipe wear fast, especially elbow wear faster. When the wear resistant pipe conveying a strong corrosive gas, liquid or solid, there is a wear resistant pipeline corrosion and soon the problem of damage. When transporting the materials with high temperature in the wear-resisting pipeline, there is a very expensive problem of using the heat resistant steel tube. Listed on the wear-resisting pipeline, these problems were smoothly done or easily solved. Wear resistant pipe is widely used in wear serious mines filling, ore concentrate and tailings transport, coal-fired power plant powder, in addition to slag, ash conveying wear-resisting pipe is also very appropriate. Away from one of the molding is the whole of the tube after firing, with a special filling material will be poured into the steel tube assembly. The elbow has a smooth inner wall, good sealing performance, good wear resistance and corrosion resistance. Composite pipe due to give full play to the steel pipe with high strength, good toughness, impact resistance, welding performance and corundum porcelain high hardness, high wear resistance, corrosion resistance, heat resistance good, overcome the pipe low hardness and poor wear resistance and poor toughness ceramic characteristics. Therefore, the composite pipe has good wear resistance, heat resistance, corrosion resistance and mechanical shock resistance and thermal shock, good bonding property and so on. Is conveying granular materials, grinding, corrosive media, such as the ideal wear-resistant, corrosion resistant pipeline. Because the tube has wear resistance, corrosion resistance, heat resistance, so it can be widely used in electric power, metallurgy, mining, coal, chemical industry as a transport sand, stone, coal and coal ash, aluminum liquid grinding granular material and corrosive medium, is an ideal wear-resistant and corrosion of pipeline. The patch ceramic tube is a high temperature resistant and strong adhesive, and the alumina ceramic piece is pasted on the inner wall of the pipe. The production process is relatively simple, the production is simple, the cost is relatively large. Has a variety of models of the patch wear-resisting bend, can also be customized according to customer needs. Wear resistant ceramic elbow is generally greater than 800. Point welding card wear-resisting pipe is resistant high tenacity viscose intermediate belt hole of alumina ceramics is pasted on the inner wall of the pipe and welding process through a small hole ceramic firmly welded on the inner wall of steel pipe. In order to protect the solder joint, the ceramic cap is screwed onto the top of the solder joint. Each tile not only press each other mutual inserted and each porcelain formation trapezoid angle, so that the ceramic block between tight junction and gap; when a circle of last piece tightly embedded, ceramic blocks between formation mechanical interlocking force of 360 DEG (this technique in centuries ago is used in Chinese Bridge Construction Engineering). Each tile not only press each other mutual inserted and each porcelain formation trapezoid angle, so that the ceramic block between tight junction, seamless; the production process is relatively complex, long production cycle, the cost is higher. All kinds of anticorrosion lining plastic pipe: Steel (PP, PE, Po, PVC) pipes, polyethylene lined steel pipe, steel lining polyolefin pipe, polypropylene lined steel pipe, steel lined with PVC pipe; chemical water conveying pipeline, wear resistant pipe, resistance to pipeline corrosion, high temperature pipeline (160 DEG) is a chemical industry special anticorrosive wear-resisting pipe. Wear resistant industrial pipe wear has been a factor in the safe and civilized production, with the continuous development of science and technology, innovation of materials appeared cast stone, cast steel, alloy, ceramics bonded and materials. Which alumina ceramic lined pipe with high wear resistance, high hardness, oxidation resistance, resistant corrosion and high resistance to high temperature strength properties has become a kind of the most widely used wear-resistant materials, takes up about 80% of the world special ceramics market share (wear-resistant materials). The hardness of the fused alumina layer is as high as 1100 - 1500 (90-98), which is equivalent to the hard gold of tungsten and cobalt. The wear resistance is more than 20 times higher than carbon steel pipe, and it is superior to the performance of corundum grinding wheel which is bonded together. At present, Shandong Huaxing Electric Auxiliaries Co., Ltd. is the production of ceramic lined composite steel pipe using dozens of thermal power plant practice show that the ceramic lined composite steel pipe abrasion resistant ability is high, the fluid erosion resistant ability strong. In the primary air pipe, the wear of the elbow is the fastest, and the wear resistance of the ceramic lined composite steel pipe bend is more than 5 times higher than that of the thick wall. In practice, 1-2 years after the use of ceramic lined composite steel pipe open were observed and measured, composite layer had no obvious wear and tear or fall off, in the same specification and unit length of pipe, ceramic lined composite steel pipe weight only the wear-resistant cast steel pipe or double metal composite pipe of about 1 / 2, the per meter project cost reduce 30-40%, about only two fifths of cast stone pipe and rare earth wear-resistant steel pipe weight, per meter project cost reduced more than 20%. The ceramic lined composite steel pipe used in high-temperature and corrosive places, its price only stainless steel tube, nickel titanium tube of a fraction of the ceramic lined composite steel pipe except for coal-fired power plants in addition to ash, slag, powder, powder, also widely used in following industries: 1, mine: 1.2 1.1 coal industry coal water slurry, coal washery, mines filling, coal mine metal mines: concentrate and tailings of pipeline transportation. 2, metallurgy: 2.1 steel plant iron blast furnace coal injection, slag and other pipeline, 2.2 steel conveyor iron alloy, furnace refining preferred pipeline. 3, cement factory: rotary kiln production line of wet raw slurry transportation, coal transportation, hoist material, concrete pipeline. Wear resistant elbow - stick ceramic plate and the Central South University of technology of Powder Metallurgy Research determined, the wear resistance of the ceramics is equivalent to 266 times of manganese steel, 171.5 times of high chromium cast iron, excellent wear resistance. Wear resistant elbow in the application of milling system greatly reduced the wear of equipment, according to more than ten years of experience in the field of operation, durability of at least 10 years or more, reduce maintenance frequency and cost. Centrifugal casting composite ceramic, corundum layer hardness up to HV1100-1400, equivalent to tungsten cobalt hard alloy. The weight of the composite ceramic bend is only the 1/4 of wear-resistant steel elbow, easy to install and replace. The hardness of corundum ceramics is HRA80-85, which is much higher than that of wear resistant steel and stainless steel. The density is only half of the steel, and the weight of the ceramic elbow is only 1/3 of the wear-resistant steel elbow. Centrifugal casting composite ceramics, ceramic steel pipe in the melting point of 2045 degrees, corundum and steel due to the special structure of the process, the stress field is also special. When temperature is increased to 900 DEG C, the ceramic pipe into the cold water, repeatedly, ceramic layer does not crack or crack showed that is unparalleled in the ordinary ceramic thermal shock resistance, ceramic pipe, the inner dense alpha type aluminium oxide, acid degree 96-98%. 3. oxidation 2 aluminium oxide, and acid, alkali, salt were not chemical reaction. Three aluminum oxide is an inorganic material, in the light, heat, oxygen and other natural environment for a long time, there is no deterioration of the performance (that is, aging) problem. The corrosion resistance of ceramic tubes is ten times higher than that of stainless steel. Ceramic pieces are installed on the inner wall of elbow by using high temperature inorganic adhesive. Company and Tsinghua University fine ceramic State Key Laboratory of joint development of the adhesive, strong adhesion, high temperature resistance, aging resistance, to ensure that will never fall off, Dongfang Hitachi and other boiler manufacturers in the burner installed ceramic paste are the glue. The installation technique is simple and reliable. Ceramic belongs to inorganic material, does not have the oxidation corrosion, acid and alkali corrosion. Centrifugal cast composite ceramics belong to the overall ceramic, there is no gap, the surface is smooth, does not exist inside the ceramic high bottom view. After high temperature sintering, the structure is compact, and the surface is smooth and smooth after the grinding. The placement process strictly in accordance with the & laquo; work instruction & raquo; ensure the smooth transition of the tiles, height difference is less than 0.5mm, posted a ceramic pipe inner wall smooth smooth without blocking powder. Copyright © 2019 Unisite Group Ltd.Todos os direitos reservados.